Day # 1 - Top of the mornin' to ya! 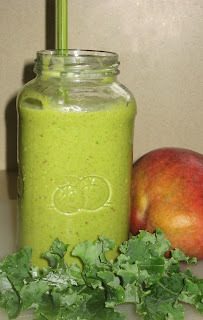 Here's a green smoothie, just in time for St. Patties' Day!! 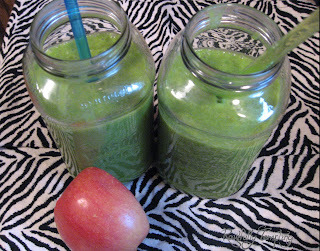 If you've never tried green smoothies before...don't be shy, give it a try. They may look intimidating, but they're very tasty and energizing. They're also alkalizing, which promotes healing. Go Green! What's so good about green smoothies? Smoothies are all fun and nutritious, but green smoothies are a great way to eat your veggies and are super alkalizing, mineralizing and just plain healthy! The problem is, we usually don't get enough of them. By blending greens into your smoothies, you can combine them with fruits or herbs, and create a variety of delicious flavors. Come on!!! If I can give it a try, you can too! Join me in this newest adventure. Start by including just 1 green smoothie a day...and tell us about it. We'd love to hear about your experiences. Blending is the quickest and easiest way to prepare large amounts of raw food and get the nutrients you need. It requires very little prep time and you can make the most scrumptious smoothies in a matter of minutes. Make a larger batch and bring it to work with you, sipping it throughout your day. Notice how energized you feel, and at the same time, decrease your cravings for sweets. While it's ultimately nice to have a high speed blender, for getting started, you can use your regular blender and still get good results. When you find this is something you want to pursue, you will you'll want to look into purchasing a high speed blender like Vita-Mix or Blentec. (Check eBay for a lightly used one). These blenders break down the cell wall of the vegetables and enable you to get the maximum nutrients from your food. High speed blenders can handle tough fibers that you will want to use, like ginger, tomatoes and carrots, so you absorb the beneficial nutrients like lycopene and beta-carotene that you don't necessarily get from chewing these foods. Blending makes it easy for your body to absorb these beneficial nutrients and unlike juicing, uses the fibers of the fruits and vegetables. Leafy Greens: Use at least 2 of these, if not more: romaine, spinach, kale, chard, sunflower sprouts, pea green sprouts, bok choy, other lettuces, lambs quarters, parsley, beet tops, carrot tops, dandelion, plantain, stinging nettle, arugula, collards, red clover etc. *Be generous with your greens and experiment with different combos. Select at least 2 different leafy greens but feel free to use more. Fruit: Fruit is more of an accent to help make the leafy greens and veggies more palatable. Try adding 2 pieces of whole fruit or a similar amount of smaller fruits. Some examples are: pears, mangoes, papaya, bananas, apples, oranges, blueberries, raspberries, strawberries, coconut, etc. Sometimes I add a Medjool date as a natural sweetener. Special ingredients: These are optional, but feel free to experiment. Kelp powder, spirulina, lime, lemon, ginger, etc. To add in some healthy fats, go easy on these: avocado, flax seed oil, ground flax seeds, etc. Note: Ok..this was my first try..and this combo..was NOT the best. Use the basic steps and try creating your very own green smoothie. Fill your blender up with your assortment of leafy greens. Add 1 cup of water (or chosen liquid), and and pulse it down. Fill with your fruit selection, and blend. Add water as needed. Add your extras, ground flax seeds, flax seed oil, spirulina, dates, coconut, etc. *The goal is to blend green leafy veggies and fruit together at about a 40:60 ratio, but don't go crazy trying to figure it out. Victoria Boutenko provides a lot of great information on smoothies. Check out her videos here. *Note to my fellow IC'ers - Use extra water to dilute your smoothies. I think it's gentler on our systems. Be sure to drink a lot of water throughout the day. I use Reverse Osmosis water from Whole Foods. Some people promote using alkalizer filters. I will tell you this - IT FLARED UP MY IC BIG TIME! Those filters add minerals to the water that can seriously irritate the bladder as it passes through. RO water has been the easiest for me to digest. I add a product called Hydra Booster, but started with only 1/2 a capful in a 40 ounce water bottle. As you change your diet and slowly detox, your body will become more alkaline. am not expert, but was told by a nutritional biochemist that ingesting alkaline water in an acid body, is not going to make your body more alkaline. An acid body cannot absorb the alkalinity, and it will just pass through your urine. I found the alkaline water to be extremely harsh on my body. I'm a little concerned about the smoothies, so as noted above, I'm using extra water and making it a point to hydrate myself well. I am psyched. No more rice and nama shoyu on my prescribed program, so I can really go to town now with my green smoothies. We'll see. I heard so many wonderful stories about how people healed themselves using green smoothies, so I am hopeful that I will also have good results. Fellow IC'ers (folks diagnosed with Interstitial Cystitis) know that we are very sensitive to certain foods and are not always sure how we will react to something new. I had some urgency and a little burning for several hours after my smoothie yesterday, so will be monitoring this closely. I think IC'er may wish ti dilute their smoothies with more water and sip throughout the day. That is what I'm going to try. We do better moving things S L O W L Y over trying to quickly purge or cleanse quickly. Wish me luck! Green Smoothie - Day #3 - EH! Not one of the best. Will keep trying! They sure are...I jumped right in with experimenting. Some have been great, some not so great..but they all make me feel really positive!